Heated Seats, Sunroof, Keyless Start, CD Player, Back-Up Camera, WHEELS & SUNROOF PACKAGE, Turbo, Bluetooth. DEEP BLACK PEARL EFFECT exterior and CORNSILK BEIGE LEATHERETTE W/BROWN PIPING interior, 2.0T Wolfsburg Edition trim CLICK NOW!KEY FEATURES INCLUDEHeated Driver Seat, Back-Up Camera, Turbocharged, Satellite Radio, iPod/MP3 Input, Bluetooth, CD Player, Keyless Start, Heated Seats. MP3 Player, Keyless Entry, Steering Wheel Controls, Child Safety Locks, Heated Mirrors.OPTION PACKAGESWHEELS & SUNROOF PACKAGE Illuminated Vanity Mirror, Wheels: 18 Twin 5-Spoke, Tires: 18 All Season, Power Tilting & Sliding Sunroof. Volkswagen 2.0T Wolfsburg Edition with DEEP BLACK PEARL EFFECT exterior and CORNSILK BEIGE LEATHERETTE W/BROWN PIPING interior features a 4 Cylinder Engine with 174 HP at 5000 RPM*.EXPERTS ARE SAYINGGreat Gas Mileage: 36 MPG Hwy.WHY BUY FROM USWe've been honored with several customer service awards, including a Volkswagen Generation Best Dealer award. We offer autos made with the power of German engineering. Volkswagen has thought about every detail of every car, every step of the way.Horsepower calculations based on trim engine configuration. Fuel economy calculations based on original manufacturer data for trim engine configuration. Please confirm the accuracy of the included equipment by calling us prior to purchase. Moonroof, Heated Seats, Keyless Start, CD Player, Back-Up Camera, WHEELS & SUNROOF PACKAGE, Turbo Charged Engine, Bluetooth. 2.0T Wolfsburg Edition trim, DEEP BLACK PEARL EFFECT exterior and TITAN BLACK LEATHERETTE interior. SEE MORE!KEY FEATURES INCLUDEHeated Driver Seat, Back-Up Camera, Turbocharged, Satellite Radio, iPod/MP3 Input, Bluetooth, CD Player, Keyless Start, Heated Seats. MP3 Player, Keyless Entry, Steering Wheel Controls, Child Safety Locks, Heated Mirrors.OPTION PACKAGESWHEELS & SUNROOF PACKAGE Illuminated Vanity Mirror, Wheels: 18 Twin 5-Spoke, Tires: 18 All Season, Power Tilting & Sliding Sunroof. Volkswagen 2.0T Wolfsburg Edition with DEEP BLACK PEARL EFFECT exterior and TITAN BLACK LEATHERETTE interior features a 4 Cylinder Engine with 174 HP at 5000 RPM*.EXPERTS ARE SAYINGGreat Gas Mileage: 36 MPG Hwy.WHY BUY FROM USWe've been honored with several customer service awards, including a Volkswagen Generation Best Dealer award. We offer autos made with the power of German engineering. Volkswagen has thought about every detail of every car, every step of the way.Horsepower calculations based on trim engine configuration. Fuel economy calculations based on original manufacturer data for trim engine configuration. Please confirm the accuracy of the included equipment by calling us prior to purchase. Sunroof, Heated Seats, Keyless Start, CD Player, Back-Up Camera, WHEELS & SUNROOF PACKAGE, Turbo, Bluetooth. 2.0T Wolfsburg Edition trim, TOURMALINE BLUE exterior and MOONROCK GRAY LEATHERETTE W/QUARTZ PIPING interior. CLICK ME!KEY FEATURES INCLUDEHeated Driver Seat, Back-Up Camera, Turbocharged, Satellite Radio, iPod/MP3 Input, Bluetooth, CD Player, Keyless Start, Heated Seats MP3 Player, Keyless Entry, Steering Wheel Controls, Child Safety Locks, Heated Mirrors.OPTION PACKAGESWHEELS & SUNROOF PACKAGE Illuminated Vanity Mirror, Wheels: 18 Twin 5-Spoke, Tires: 18 All Season, Power Tilting & Sliding Sunroof. Volkswagen 2.0T Wolfsburg Edition with TOURMALINE BLUE exterior and MOONROCK GRAY LEATHERETTE W/QUARTZ PIPING interior features a 4 Cylinder Engine with 174 HP at 5000 RPM*.EXPERTS CONCLUDEGreat Gas Mileage: 36 MPG Hwy.VISIT US TODAYWe've been honored with several customer service awards, including a Volkswagen Generation Best Dealer award. We offer autos made with the power of German engineering. Volkswagen has thought about every detail of every car, every step of the way.Horsepower calculations based on trim engine configuration. Fuel economy calculations based on original manufacturer data for trim engine configuration. Please confirm the accuracy of the included equipment by calling us prior to purchase. Moonroof, Heated Seats, CD Player, Keyless Start, Back-Up Camera, WHEELS & SUNROOF PACKAGE, Turbo Charged, Bluetooth, iPod/MP3 Input. TOURMALINE BLUE exterior and TITAN BLACK LEATHERETTE interior, 2.0T Wolfsburg Edition trim. SEE MORE!KEY FEATURES INCLUDEHeated Driver Seat, Back-Up Camera, Turbocharged, Satellite Radio, iPod/MP3 Input, Bluetooth, CD Player, Keyless Start, Heated Seats MP3 Player, Keyless Entry, Steering Wheel Controls, Child Safety Locks, Heated Mirrors.OPTION PACKAGESWHEELS & SUNROOF PACKAGE Illuminated Vanity Mirror, Wheels: 18 Twin 5-Spoke, Tires: 18 All Season, Power Tilting & Sliding Sunroof. Volkswagen 2.0T Wolfsburg Edition with TOURMALINE BLUE exterior and TITAN BLACK LEATHERETTE interior features a 4 Cylinder Engine with 174 HP at 5000 RPM*.VEHICLE REVIEWSGreat Gas Mileage: 36 MPG Hwy.WHO WE AREWe've been honored with several customer service awards, including a Volkswagen Generation Best Dealer award. We offer autos made with the power of German engineering. Volkswagen has thought about every detail of every car, every step of the way.Horsepower calculations based on trim engine configuration. Fuel economy calculations based on original manufacturer data for trim engine configuration. Please confirm the accuracy of the included equipment by calling us prior to purchase. Heated Seats, Sunroof, CD Player, Keyless Start, Turbo Charged, WHEELS & SUNROOF PACKAGE, REAR TRUNK LID LIP SPOILER, Back-Up Camera. PURE WHITE exterior and TITAN BLACK LEATHERETTE interior, 2.0T Wolfsburg Edition trim. CLICK NOW!KEY FEATURES INCLUDEHeated Driver Seat, Back-Up Camera, Turbocharged, Satellite Radio, iPod/MP3 Input, Bluetooth, CD Player, Keyless Start, Heated Seats. MP3 Player, Keyless Entry, Child Safety Locks, Steering Wheel Controls, Electronic Stability Control.OPTION PACKAGESWHEELS & SUNROOF PACKAGE Illuminated Vanity Mirror, Wheels: 18 Twin 5-Spoke, Tires: 18 All Season, Power Tilting & Sliding Sunroof, REAR TRUNK LID LIP SPOILER. Volkswagen 2.0T Wolfsburg Edition with PURE WHITE exterior and TITAN BLACK LEATHERETTE interior features a 4 Cylinder Engine with 174 HP at 5000 RPM*.EXPERTS ARE SAYINGGreat Gas Mileage: 36 MPG Hwy.VISIT US TODAYWe've been honored with several customer service awards, including a Volkswagen Generation Best Dealer award. We offer autos made with the power of German engineering. Volkswagen has thought about every detail of every car, every step of the way.Horsepower calculations based on trim engine configuration. Fuel economy calculations based on original manufacturer data for trim engine configuration. Please confirm the accuracy of the included equipment by calling us prior to purchase. Heated Seats, Sunroof, CD Player, Keyless Start, Turbo, WHEELS & SUNROOF PACKAGE, Back-Up Camera, Bluetooth. 2.0T Wolfsburg Edition trim, DEEP BLACK PEARL EFFECT exterior and CORNSILK BEIGE LEATHERETTE W/BROWN PIPING interior. CLICK NOW!KEY FEATURES INCLUDEHeated Driver Seat, Back-Up Camera, Turbocharged, Satellite Radio, iPod/MP3 Input, Bluetooth, CD Player, Keyless Start, Heated Seats MP3 Player, Keyless Entry, Steering Wheel Controls, Child Safety Locks, Electronic Stability Control.OPTION PACKAGESWHEELS & SUNROOF PACKAGE Illuminated Vanity Mirror, Wheels: 18 Twin 5-Spoke, Tires: 18 All Season, Power Tilting & Sliding Sunroof, FRAMELESS SELF-DIMMING REARVIEW MIRROR HomeLink garage door opener and electronic compass. Volkswagen 2.0T Wolfsburg Edition with DEEP BLACK PEARL EFFECT exterior and CORNSILK BEIGE LEATHERETTE W/BROWN PIPING interior features a 4 Cylinder Engine with 174 HP at 5000 RPM*.EXPERTS REPORTGreat Gas Mileage: 36 MPG Hwy.OUR OFFERINGSWe've been honored with several customer service awards, including a Volkswagen Generation Best Dealer award. We offer autos made with the power of German engineering. Volkswagen has thought about every detail of every car, every step of the way.Horsepower calculations based on trim engine configuration. Fuel economy calculations based on original manufacturer data for trim engine configuration. Please confirm the accuracy of the included equipment by calling us prior to purchase. If you want to enhance your style and capability out on the road, buy or lease a new Volkswagen at our VW dealership near Omaha, NE. Thinking about upgrading your daily drives to a new VW sedan? Come test-drive the new Volkswagen Jetta or VW Passat. Have something a little more family-friendly in mind? Rest assured that you can test-drive the new VW Tiguan or Atlas, too. But, if you want to cruise in one-of-a-kind style, open the door to a new VW Golf, Golf GTI, Golf Alltrack or the iconic VW Beetle and own the road. 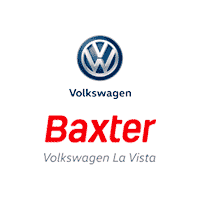 Whichever new Volkswagen model wins your heart, Baxter Volkswagen La Vista will help you buy or lease it for less!